The chefs got a surprise from Ramsey as a group of runners lined up outside of Hell’s Kitchen. It was the first ever HK3K run. The chefs thought they all had to run, but instead Mary and Dan had to run alongside the runners while the rest had to cook lunch for them. The special guests was the Fastest Man on the Planet Maurice Greene, the first female American to win six medals in the Olympics Natalie Coughlin and 2012 Olympic medalist Danell Leyva. To say the chefs swooned over the runners is an understatement. They were practically blushing. Dan made the run no problem. Mary on the other hand, looked like she was about to go into cardiac arrest when she came back. Poor girl. The menu for the runners included a grilled flank steak wrap, pan seared salmon, edamame portabella burger and sweet potato fries. It sounded like nice menu, and, knowing this is Hell’s Kitchen, there were bound to be some disasters. Zach made some pre-seared salmon and got some flack form Ramsey. He would later make a raw salmon and then try to reheat one of the pre-seared ones. Ramsey challenged him on this and of course, he denied the whole thing. Surprising seeing as how Zach so far was a strong contestant. Besides that Danielle was also a little slow with the fries. Sure enough, the Red one and Ramsey told them to help the blue finish service. Everyone say thanks Zach. The Red’s prize was a trip to California’s wine country and they got there on a private jet. The Blue had to spend the day cleaning up the HK3K route and prep the kitchens. Jon had the line of the day, “Hey, look at me mom. I’m on a chain gang,” he exclaimed. The dinner service that night, though not without problems, was much better than last week’s. In the Blue, Ramsey called out the orders slowly as the Blue asked. Pretty pathetic, no? The first mistake was Ray’s risotto was hard and had to be brought back. What was worse is that this risotto was for Ryan Hollins from the LA Clippers. After burning a second risotto, Ray made a good one. On entrees, Dan and Michael had some problems with each other. Dan couldn’t make a decent lamb, Michael got a little hot headed and fight almost ensured. Good thing Ramsey took both in the back to stop that from happening. A much better performance than the last two services. On the Red Jessica made a gigantic pan of risotto. It looked like enough for five portions when the ticket only called for one. Jacqueline, pulling off a move only an amateur would, made chicken that was still pink in the middle. To round up the Red Team’s night, Danielle made two overcooked Wellingtons and then a perfect one. Both teams finish service with Ramsey declaring the Blue Team victorious. The Red chose Danielle and Jessica for elimination. However, Ramsey wanted to see Jacqueline up there as well. Ramsey asked Nedra why she thought Jessica should go home. When Nedra couldn’t come up with an answer, Jessica was told to go back in line. In the end, Danielle was sent home. This crop of chefs is proving to be much better than last year’s. They are much more likable, better at cooking, the challenges are more entertaining and there is less unneeded conflict. 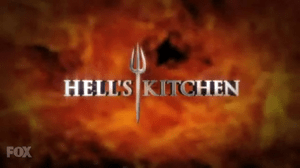 So far this season is a contestant for one of the best “Hell’s Kitchen” seasons yet.